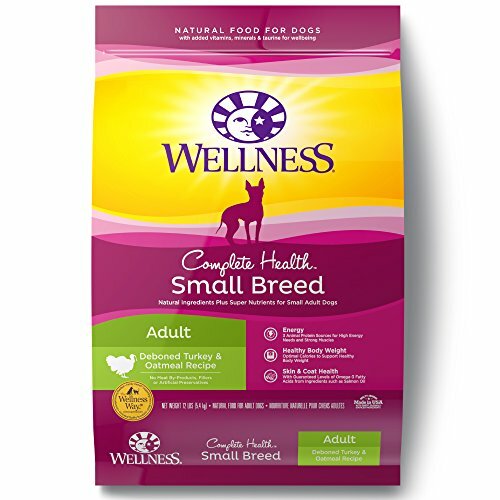 We’ve chosen Wellness Complete Health Small Breed as the best dog food for Yorkies with respect to the key metrics of quality ingredients, benefits, taste, customer feedback, and value. Wellness is a premium dog food brand trusted by breeders, show dog owners, and customers alike. The Yorkshire Terrier, known affectionately as Yorkie, is a toy-breed dog not to exceed 7 pounds according to the breed standard. Although many owners chose to cut their Yorkie’s hair short for ease of maintenance, the breed’s flowing long hair parted down the middle is one of the most distinctive looks of all dog breeds. It wouldn’t surprise anyone if celebrities who parted their hair down the middle were inspired by the ever-popular Yorkie, especially those wearing straight dirty blonde hair parted down the middle (Jennifer Aniston for example). 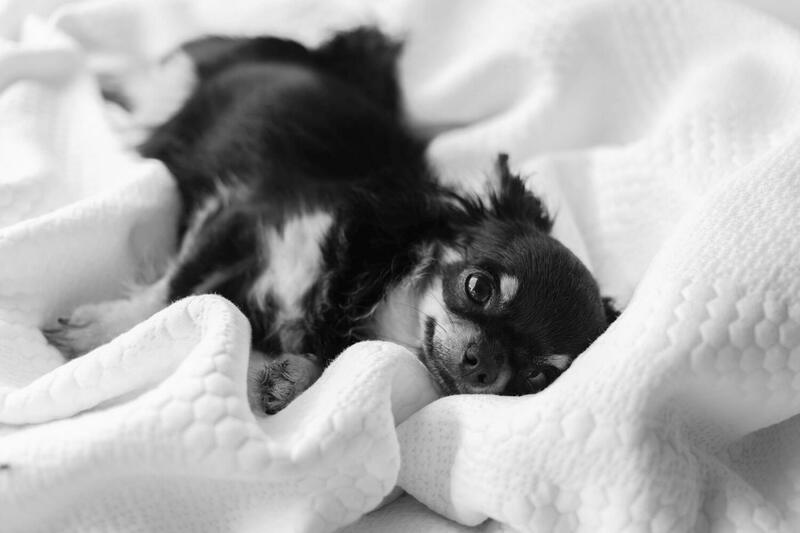 Adult Yorkies have a higher metabolism than big dogs but not as high as most toy breeds (such as the Chihuahua with notoriously high metabolism). This is why hypoglycemia or accelerated drop in blood sugar usually occurs only in Yorkie puppies up to a few months old. It is also why we recommend small breed dog food formulas rather than toy breed for Yorkies. Yorkies are picky eaters. It’s a challenge to get most of them to eat dry dog food even though it is the best food for all their nutritional needs. It may not be as much of a problem once or twice but it can be problematic as soon as they realized that this dry dog food is all they’d be getting. We have tried to pick dry dog foods that are most agreeable to Yorkies taste wise. Sometimes it also works to switch up two different dry foods. Natural Balance’s Original Ultra label emphasizes the complete bodily wellbeing of a dog – what the company termed Whole Body Health. It’s a gluten-free dry food with good quality ingredients. We recommend the Original Ultra Small Breed formula for Yorkies. The animal protein sources of this formula are fresh chicken, chicken meal, and duck meal. Fresh chicken is also the first ingredient, followed by brown rice, oat groats, chicken meal, dried potatoes, and dried peas. Chicken, brown rice and oats are all friendly to a Yorkie’s digestion, and with just enough pea fiber (3%) to help move things along. This formula includes an array of supplements plus antioxidants from cranberries, blueberries, spinach, kelp, yucca extract, and rosemary extract. Omega 6 and Omega 3 fatty acids are from flaxseed and menhaden oil. Carbs content is high since protein and fat are 23% and 13%, but this is not a concern since it contains enough complex carbs and a Yorkie’s high metabolism would take care of the rest. The calorie content is 360 kcal/cup or 3600 kcal/kg. All in all Natural Balance Original Ultra Small Breed is an excellent dog food for Yorkies at a very reasonable price. 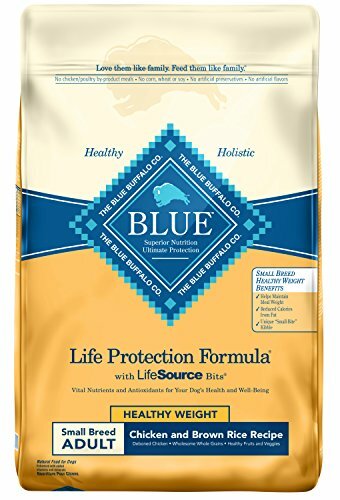 We are a proponent of multiple formulas under Blue Buffalo’s Life Protection label, and the best of them is the Small Breed Healthy Weight formula based on chicken and brown rice. This is the perfect dog food for Yorkies with weight issues. Considering that Yorkies are the supermodels of dogs, the last thing they need is to be overweight. Please don’t confuse this statement for fat-shaming or setting unreasonable ideals for sweet Yorkies. We do understand that there’s a need for plus-size supermodels as well, but the fact is overweight Yorkies can run into all sorts of issues as they advance in age, so it’s best to keep it in check. The ingredients used in Blue Buffalo Life Protection Small Breed Weight Management are high-quality throughout. The top ones are deboned chicken, chicken meal, whole ground brown rice, whole ground barley, rice bran, oatmeal, peas, and turkey meal. This is a low-fat dog food with only 10% fat and 25% protein. The fiber content is intentionally high (8%) to help your Yorkie feel as if he or she is full despite eating less. As expected, this dog food has the lower calorie content of 333 kcal/cup. You’ll also find fruits and vegetables in this dog food to keep your Yorkie healthy while losing and maintaining weight toward the supermodel ideal. Wellness is one of the most highly regarded premium dog food brands. In fact, we chose Wellness as our top pick for dachshunds, as well. 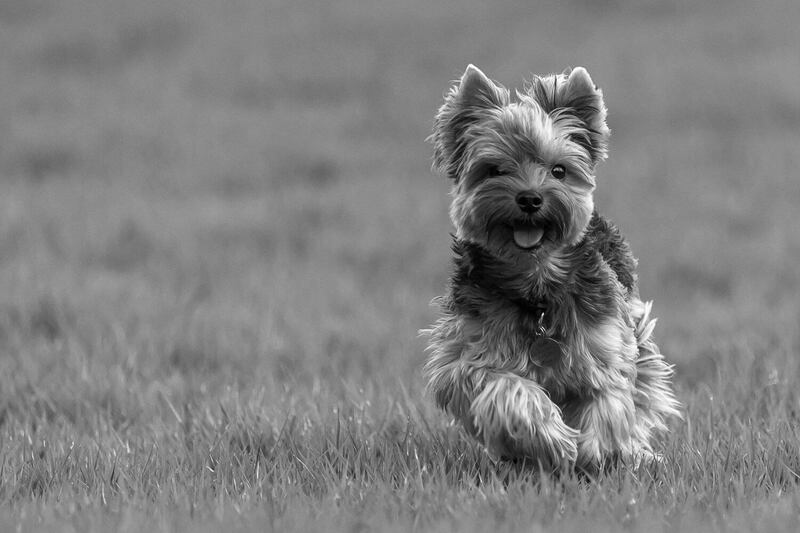 Among their two main product lines, Complete Health and CORE, we prefer the original Wellness Complete Health Small Breed for Yorkies. It’s an excellent turkey and oatmeal based dog food. There are two characteristics that distinguish good dog foods from the mediocre ones. Good dog foods take longer to digest because they are packed with nutrients. It should take a dog a good 12 hours, give or take about 2 hours, to go to the bathroom after eating. The cheapest dog foods make a dog defecate within several hours. There’s not much in the food to absorb so in and out it goes. The second characteristic is the poop, which should be firm (but not hard) and compact. Good dog foods are packed with nutrients, many of which would be used by the body instead of passing as waste. A dog on a good dog food would not poop as much as a dog on a mediocre dog food that’s light in nutrients. 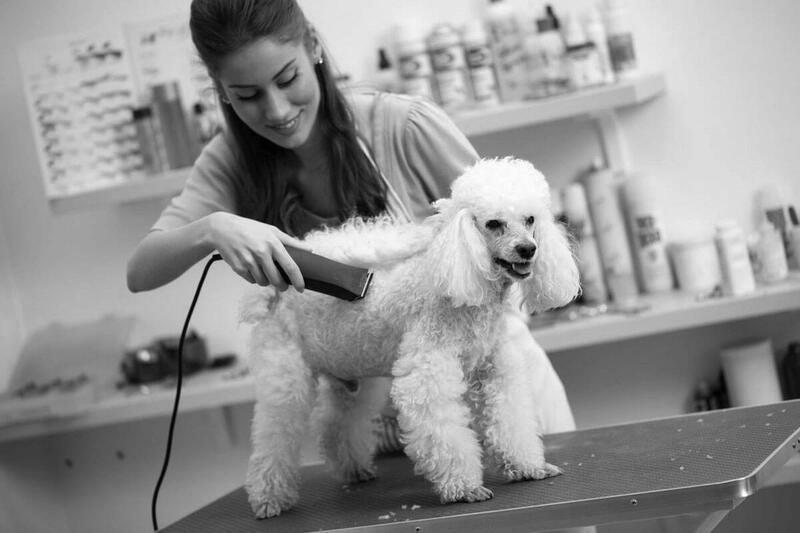 Wellness Complete Health Small Breed not only passes the two tests, it passes easily with flying colors. Within a week you’ll notice a marked difference in your Yorkie’s coat and skin conditions. One can just tell from the top 3 ingredients of deboned turkey, salmon meal and chicken meal that this dog food contains a healthy dose of protein. The protein and fat contents are 28% and 15% which correspond to a high-calorie content of 420 kcal/cup. This formula contains fruits and vegetables in quantities significantly higher than added supplements, which is in contrast with lesser premium dog foods that often list fruits and vegetables after chemical supplements. We can say with confidence that Wellness Complete Health Small Breed is the best dog food for Yorkies. This premium dog food is filled with high-quality animal proteins and complex carbs to gradually supply the energy that a Yorkie would need throughout the day. Wellness performs strongly in taste tests so chances are even fussy Yorkies would find it agreeable. For Yorkies that could stand to lose a few pounds, we recommend Blue Buffalo Life Protection Small Breed Healthy Weight. This formula is also great for Yorkies that have a tendency to regain lost weight. We recommend it for both weight loss and weight maintenance. 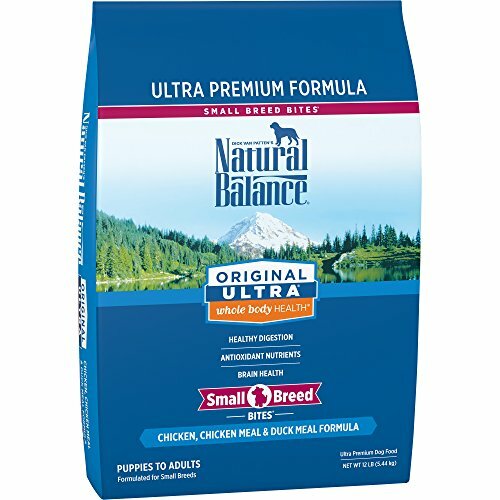 Finally, Natural Balance’s Original Ultra Small Breed formula should be a no-brainer for those who demand absolute value in dog food. The price is a bargain for a premium dog food.